It has taken O2 quite a long time to add HTC's latest Advantage device to its range, but it has finally appeared in the form of the Xda Flint. The Flint is an unusual size and shape. It comes in two separate pieces with a keyboard that fixes to the screen using magnets. 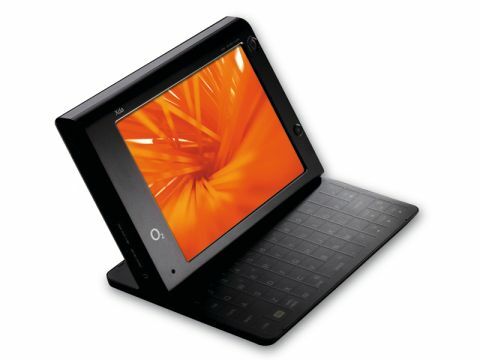 Due to its ungainly size, you'll need very big pockets, and it comes with a carry case that rivals a netbook for size. The advantage of this size is a 5-inch screen with a sharp VGA 640 x 480-pixel resolution that makes Windows Mobile usable for basic office work. The keyboard isn't large enough for two-handed touch-typing, but we found it fine for fast hunt-and-peck work. The keys are flat, but deliver a haptic feedback – vibrating each time you press a button so you know your actions have registered – which really helps with the typing speed. This is a 3G device with HSDPA for rapid and smooth web browsing and reasonable download speeds. A front camera is also provided for two-way video calling. Wi-Fi lets you connect to wireless networks when in range, and Bluetooth and GPS are integrated too. As this is such a large-screened device, it would work well in a vehicle for point-to-point navigation, but it's far too cumbersome to be used with any ease on foot. It also works well as a Pocket PC but, again, it's simply too large to hold to your ear to make private calls. Video calls are great though, as the onscreen image is suitably large. There is 16GB of flash memory included and an old-fashioned miniSD card slot for adding more. Overall we like the Xda Flint but, in terms of usability, it falls uncomfortably between a netbook and a smartphone without offering the specific usability of either.